Are you having trouble understanding the difference between an open electrical circuit and a shorted circuit? In this article I will try to explain the different types of electrical faults and how to test your circuits. First let’s cover some terms we will be using in this article. · Open Circuits: Open circuits are by far the most common of electrical faults. Open circuits are broken wires, open or corroded connectors, defective switches, etc. Anything that forms resistance so that current can’t pass through it will become an open circuit. Broken wires can be caused by repetitive bending of wires such as on a seat harness, or chafing of the wire against another component. Switches can become mechanically broken or corroded. · Shorted Circuits: A short circuit occurs when current flows directly to common instead of through a load. Because a path directly to common has much less resistance than a load, electricity will not only choose this path (electricity always follows the path of least resistance), but it will do so with increased current, usually resulting in a blown fuse. 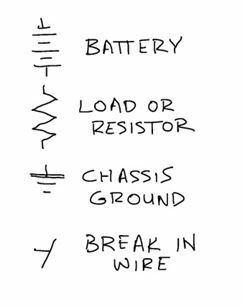 · Grounded Circuits: These are circuits that have become grounded, connected to the frame or chassis. A wire that has been rubbed through and lies against the frame is one example. · Source Voltage: The system voltage available to the circuit measured at the battery. Common voltages are 12v, 24v, 36v, and 48v ± 2v. · Common or COM: Electric powered forklifts do not use a chassis grounded circuit common in the automotive industry. Forklifts use an insulated circuit consisting of wires, cables, terminals and connections that complete circuit to the common side of the power source. This can be the positive or negative side of the circuit although negative is the most common in modern lift trucks. This is an important concept to understand when diagnosing electrical circuits in your electric powered forklift. · Fusible Link: A wire or cable designed to melt open when subject to high current in a circuit opening the circuit to prevent further damage. Like a fuse these need to be replaced when found blown open. When troubleshooting electrical circuits, we encounter three types of faults. Types of faults are open, shorted, grounded or a variation of these. Often, technicians confuse open circuits with short circuits. Remember, an open circuit is one where the circuit has actually had current flow stopped by extremely high resistance. A short circuit is too much current flow due to very low resistance. A voltage drop test is the best method for testing open circuits. The quickest way to narrow down your search is to look for available voltage. Using the appropriate wiring diagram, identify some easily accessible areas to measure for available voltage. With one probe on the wire in the circuit, place the second probe on the common post. If you measure source voltage that means that you have an open circuit between your meters leads. Move the positive lead to another test location closer to the ground point while keeping the other lead on the COM. As you move down the circuit you will eventually find a spot where the meter will read less than 0.1 volts. When this happens you know that the voltage is being dropped somewhere between your last test point and COM. Using your wiring schematic as a guide, you can determine what component, wire or connection needs further inspection or testing. Although not as common as open circuits, short circuits do occur and can be troublesome to diagnose. A short circuit will blow a fuse, melt a fusible link, or cause a circuit breaker to trip. Diagnosing a short circuit involves replacing one of these circuit protection devices with something that can handle the excessive current flowing in the circuit. Many different forms of “short finders” are available on the commercial market. If you don’t own one of these you can make a useable tool by wiring a sealed beam headlight bulb with two leads with alligator clips. Wiring diagrams or schematics differ between manufacturers. Some diagrams will provide a chart showing each fuse circuit down the left hand side, with each system circuit across the top. Find the fuse that keeps blowing and move across the page from left to right noting each system circuit that you come across. By disconnecting one system at a time you can narrow down the source of the short. Other wiring diagrams will only provide a list of system circuits by fuse, or an actual wiring diagram of the fuse box. If you only have a wiring diagram to go by, you will have to be diligent in making sure you don’t miss a system circuit connected to a particular fuse. Back to finding a short circuit: Connect the headlight bulb into the fuse holder in place of the blown fuse. When you turn the circuit on, the headlight should light as it consumes the excess current. Next, identify what components are on the circuit by using the wiring diagram. Begin by disconnecting each component, one at a time, until the headlight goes out. The component you disconnected to make the headlight go out is the circuit you need to investigate. To find the actual short, with the headlight bulb still in the circuit, and the component plugged in, disconnect the circuit at various locations until you find a location where the bulb does not go out. You have now narrowed your trouble spot to somewhere between the last connector you disconnected (the one that DID NOT make the bulb go out) and the power source. Now a visual inspection or a continuity test will help you make a final diagnosis. A grounded circuit where a portion of the circuit becomes connected to the frame does not create an immediate problem until a second ground is created. This creates a short between the two circuits involved. A common mistake in forklift wiring is to install an accessory such as a light or radio and connect the negative to the frame. This can cause all sorts of problems. Never connect or “ground” any device to the frame or chassis. A headlight connected to either positive or negative side of your power source and the chassis should never light. If it does you should locate the source whether pinched, chaffed or improper wiring it needs to be corrected or risk damage to expensive control circuitry. Hopefully this gives you a better understanding of circuit problems that will help you diagnose your next forklift dilemma.